Known by the German Army as the Wotung Stellung, the Drocourt-Quéant defensive system posed a significant obstacle to the Allies as they attempted to push their offensive further eastward. The rush of the Arras battles had pushed the Corps to the D-Q Line, but they had little time to prepare and Haig was not able to provide extra artillery or tanks. In fact, there was doubt amongst the Corps commanders that the attempt would succeed at all; the survivors of August were worn out, and the new reserve troops, many of whom were conscripted, had little combat experience. Nonetheless, for the French Army to move forward in the south, the D-Q Line had to be broken. The original plan called for the Canadians to break through the D-Q Line, then a swift advance to the Canal du Nord using Raymond Brutinel’s group of armoured cars, all within a single battle. As Currie and the 1st and 4th Division found out, this was not possible. The two divisions did take the D-Q Line, after a day of tough fighting; however, the armoured cars were unable to advance as quickly as needed and artillery support was very thin. The Corps dug in for the night, expecting a counter attack, which in the end never came. As at Amiens, the troops advanced behind a concentrated artillery barrage and was faced with lines of machine gun nests, fortified bunks and barbed wire, much of which had to be taken out in hand to hand fighting. The victory at the D-Q Line, though unexpected, was another mark for the Corps very successful Hundred Days. Currie believed the fighting during the Arras battles to be the most difficult that the Corps had ever faced; however, the pace would not be slowed. Canadian losses for the D-Q Line fighting were 5 622 killed or wounded on 2 September alone, German losses are not known. Canadian Stretcher bearer redressing a wound. Advance East of Arras. Aug. 1918. Canada. Dept. of National Defence/Library and Archives Canada/PA-003179. Currie’s original battle plan called for the use of the Canadian Motor Machine Gun Brigade, organised and commanded by Raymond Brutinel. The CMMGB had been raised in 1914 but had rarely been used in a battlefield setting until the Hundred Days, since the conditions of the fighting area in the early years had not been suited to vehicles. The cars of the CMMGB went into battle at 8AM on the morning of 2 September, through a 900m gap in the creeping barrage and failed to break through. Their cars were not able to negotiate the rough terrain, and many fell under the hail of machine gun and artillery fire from the enemy lines. Seven Victoria Crosses were awarded to Canadian soldiers for their bravery on 2 September 1918: Bellenden Hutcheson, Arthur George Knight, William Henry Metcalf, Claude Nunney, Cyrus Wesley Peck, Walter Leigh Rayfield and John Frances Young. Read more about them from Veterans Affairs Canada. Brig. General Raymond Brutinel was a French business man and journalist who settled in Western Canada before the war. Brutinel believed that armed motorised vehicles were the future of modern warfare and when the war broke out raised one of the foundation motor machine gun groups that eventually formed the Canadian Motor Machine Gun Brigade. Brutinel commanded the brigade and was involved in their actions during the German push in March 1918, as well as the Hundred Days. Part of the Battle of the Scarpe, the battle for the village of Chérisy was an example of the bloody fighting that the Canadian Corps faced in the days leading up to the battle for the Drocourt-Quéant Line. The 5th Brigade was part of an advance meant to break through the Frenses-Rouvroy Line, another fortified defence leading up to the larger D-Q Line. 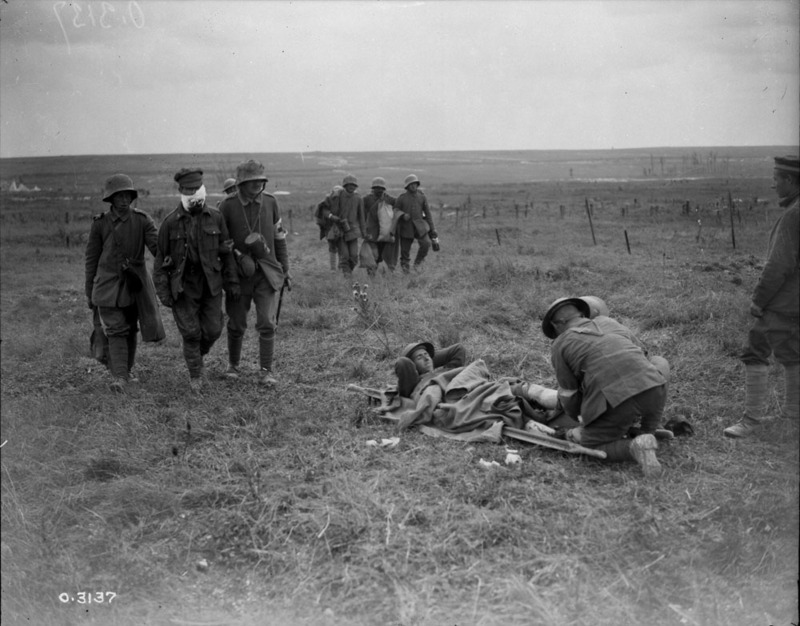 The 22nd Battalion (the Van Doos) were assigned to capture Chérisy, along with the 26th and 24th Battalions. Rain and poor conditions delayed their jumping off time, and the battle did not start until 10 am. They were fiercely resisted by the German 132rd Infantry Regiment, whose machine guns mowed down the advancing Canadians, but the village was captured by midday. The Van Doos lost many of their officers in the initial attack on Chérisy and defense of their position was organised by the highest-ranking officer left, Major Georges Vanier, in cooperation with the 24th Battalion. That night, divisional command informed the officers of the 5th Brigade, that they would not be relieved and would be expected to fight on the next morning to keep driving the Canadian sector further towards the D-Q Line. In the attack on 28 August, Vanier was wounded and command of both battalions passed to the commanding officer of the 24th Battalion, Lt-Col. William Clark-Kennedy, who continued to hold a position in front of Chérisy until they could be relieved the next day. At roll call on 29 August, only 39 members of the 22nd Battalion answered; casualties were 634 killed, wounded, or missing, including all the officers. Chérisy was one of a series of smaller set-piece battles, smaller engagements to move across large distances, that bridged the gap between Amiens on August 8 and the Drocourt-Quéant Line on September 3. Currie and the Allies in general made use of set-piece engagements to avoid the problems that came with distant objectives; they were increasingly employed after the Somme in 1916 and employed the idea of ‘biting and holding’ to chip off small pieces of enemy territory. The battle at Chérisy illustrated however, one of the challenges facing the Corps in the days after Amiens. The pace of battle since August 8 made it increasingly difficult to co-ordinate support, and in combination with the poor weather on August 26 meant that the battalions participating in the battle for Chérisy did not have sufficient counter-barrage support. The German artillery was able to continue to fire on them, and embedded machine gun nests in the village created havoc for the advancing troops as they were delayed by uncut barbed wire and uneven ground. If Currie’s Corps was to succeed in the battles to come, which moved even more quickly, the question of providing timely support was a crucial one. Chérisy was a desperate battle and there were many acts of bravery that have gone unrecorded during the two days of conflict; however, two Canadians stand out. Major Georges-Philéas Vanier, the highest-ranking officer left at the end of the August 27 advance. Vanier organised the attack for the next day, knowing that it was not likely that he would survive, and led his soldiers over the top at 12:30 on August 28. He was shot in the stomach and his leg shattered by a shell, but was evacuated and survived the battle. Vanier recovered from his wounds and went on to serve as Governor General of Canada. Click the image below to access his service file from Library and Archives Canada. Lt-Colonel William Clark-Kennedy, the remaining senior officer of the 24th Battalion, gathered the remains of the 22nd Battalion and held their position outside of Chérisy until they could be relieved. Though seriously wounded, Clark-Kennedy refused to leave his men and continued to command the battle until both units were removed. He was awarded the Victoria Cross and lived out the rest of his life in Montreal. Click the image below to access his service file from Library and Archives Canada. 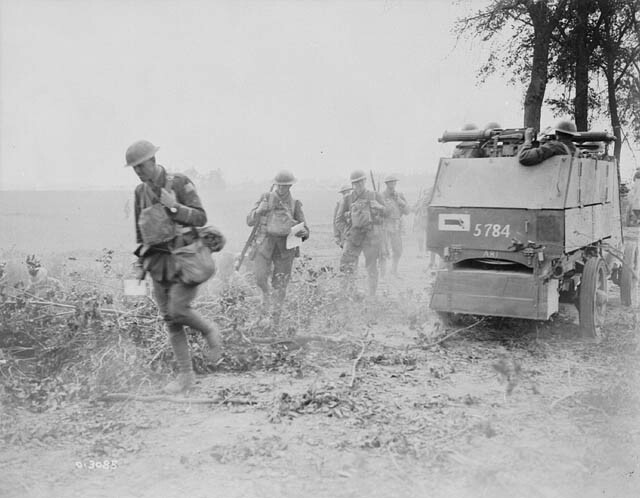 The Canadian Corps had just finished their victorious battle at Amiens on 14 August when they were charged with participating in the actions to break the German trench systems around Arras. With an estimated 12,000 casualties that needed replacing with fresh troops, the Corps was still feeling the effects of their initial entry into the Allies’ August push, but they had little choice. Currie had to prepare his men for another assault. Canadian Corps Heavy Artillery in action. Advance East of Arras. September, 1918. Canada. Dept. of National Defence/Library and Archives Canada/ PA-003133. Unlike Amiens, the Corps did not have the element of surprise and with less than a week to plan it was going to be a tough fight that relied on heavy artillery, infantry mastery, and personal courage. Once again, counter battery work was extremely important to the success of the battle, and Canadian gunners worked to ensure that German artillery had been disabled as much as possible on the day of the battle. Currie compensated for the lack of surprise by planning a night battle, which began under darkness on 26 August at 3 AM, in the pouring rain. The Corps advanced against German machine gun crews, each of which needed to be taken out to ensure forward movement. By the end of the day, the Corps had advanced 5 kilometres and retaken Monchy-le-Preux, however, it was not the end for them. The smaller attacks leading them towards the fearsome Drocourt-Quéant Line cost the Corps at least 6,000 casualties and drained precious man power; experienced soldiers that Currie could not afford to lose. German casualties are thought to be at least 3,000 prisoners, with an unknown number of dead and wounded. 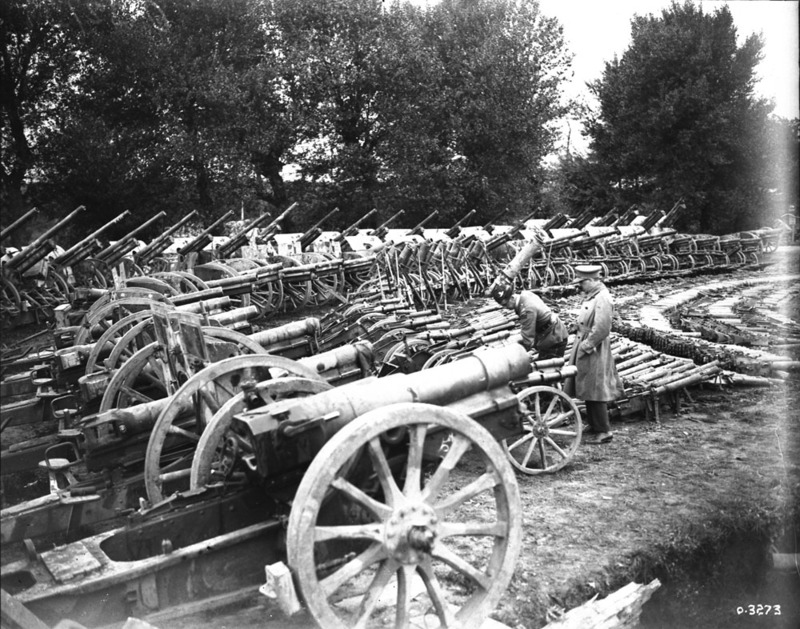 Guns captured by Canadians on Arras Front. Advance East of Arras. September 1918. PA-003219. Arras was another opportunity for the Corps to use the techniques that they had been perfecting for the past year. Currie used the Royal Air Force and his counter battery units to devasting effect, knocking out enemy guns before the day of the battle, and the infantry divisions advance quickly and freely behind a creeping barrage. 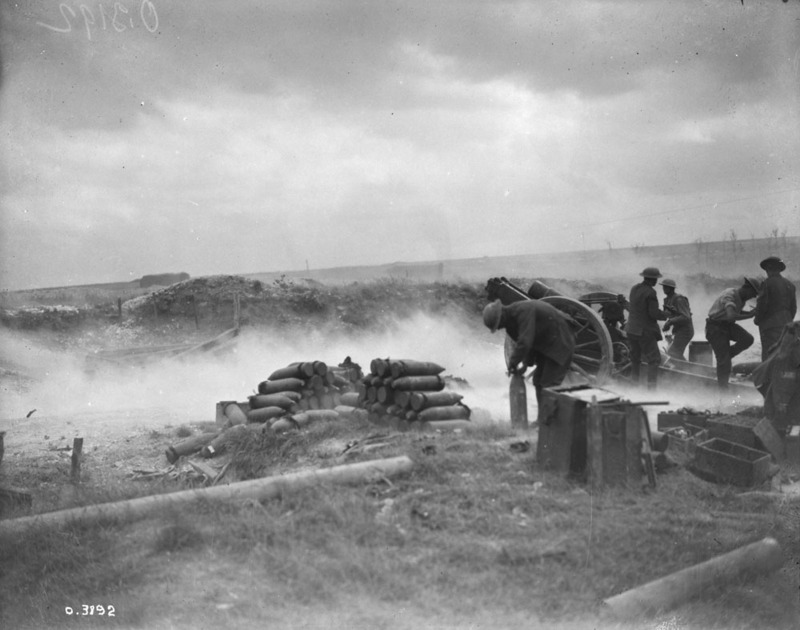 The first day of Arras also made use of a night attack, a tactic that Currie had used before when the element of surprise was missing and would use again in the coming weeks. Like Amiens, the Canadian portion of the Second Battle of Arras was planned quickly; organisation for Vimy the year before took over a month, for a typical Hundred Days battle, Currie usually had less than a week, and as the Corps advanced further and further intro German-held territory, that time shortened. Lt. Charles Smith Rutherford, of the 5th Canadian Mounted Rifles received a Victoria Cross on 26 August 1918, after attacking two pill-boxes and taking almost 100 prisoners. Rutherford survived the war and was later the Sergeant at Arms of the Ontario Legislature. Click the image below to access his full service file from Library and Archives Canada. Pte Howard Douglas Graham,was only 20 when he fought with the 21st Battalion at Arras as part of their intelligence section. He survived the war and 21 years later was a Lieutenant General in the Canadian army that returned to Europe to fight the Second World War. Click the image below to access his full service file from Library and Archives Canada. 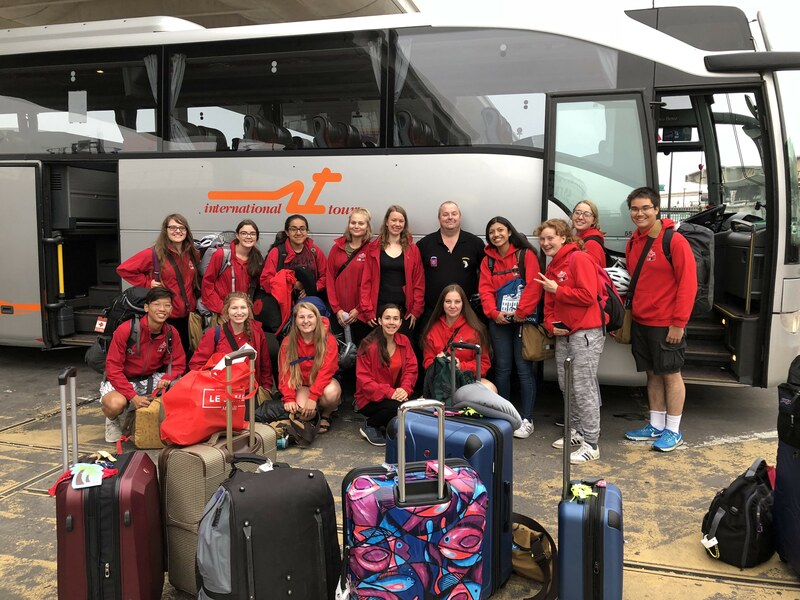 After two informative and incredible weeks, our BVP 2018 students said their goodbyes and departed for home early this morning. For the last blog entry of this program, we asked our new Beaverbrook Vimy Prize alumni to describe their experience in one sentence. (Please note: students will blog in their language of preference). On the last day of the program, the BVP 2018 recipients spent the day at Université Paris Nanterre. 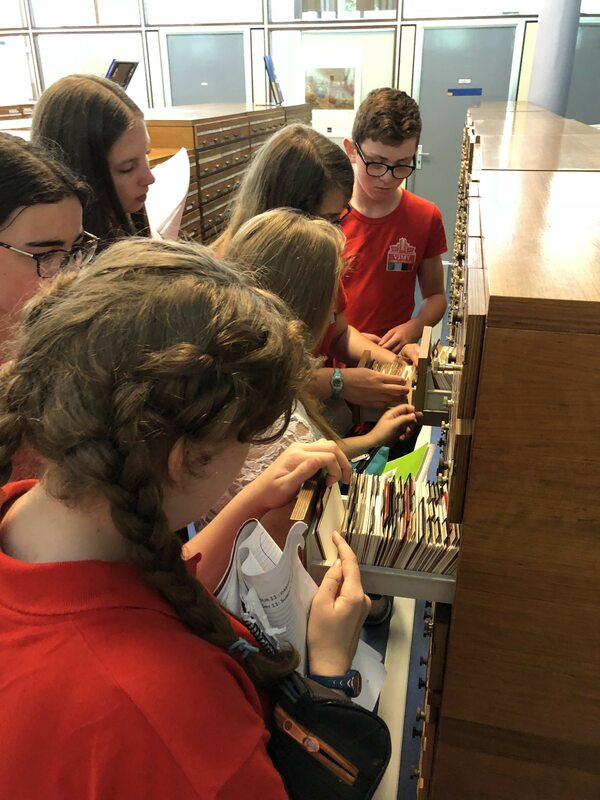 In the morning, they participated in a library and archive workshop and discussed war poetry. In the afternoon, they attended lectures by PhD candidates Gwendal Piegas and Mathieu Panoryia. (Please note: students will blog in their language of preference). 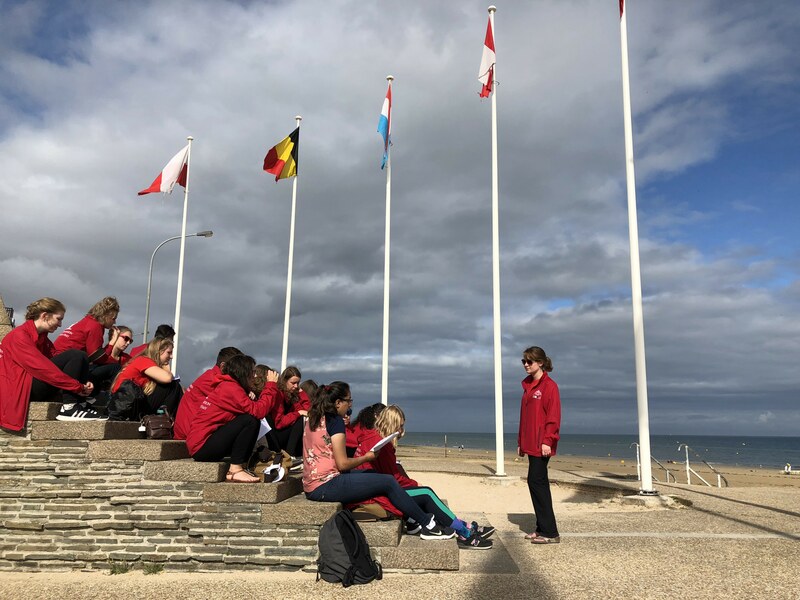 Today, our BVP 2018 recipients participated in a lively discussion on Juno Beach about war diaries during the D-Day landings. 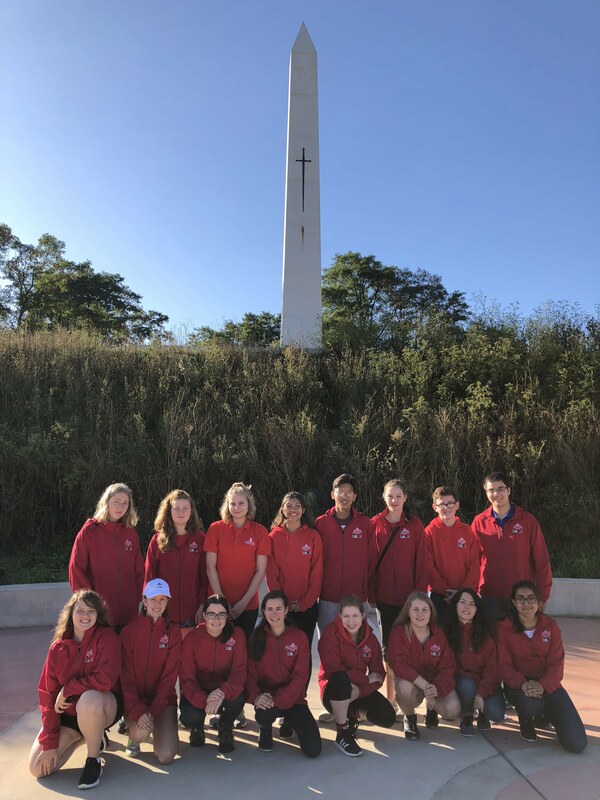 Later, they visited Beny-sur-mer cemetery where the students were able to research and locate the graves of some of the executed Canadian soldiers at Abbaye d’Ardenne. In the afternoon, they visited the German battery at Longues-sur-mer. (Please note: students will blog in their language of preference). This morning Juno beach was our classroom, and we had the privileged opportunity of reading the war diaries of the attack at Juno while we sat on the sand of the exact place it happened. It was amazing to be able to ask: “Where were the soldiers at this point in the attack?” and then have a colleague point to a house and say: “Right there.” This leaves no room for misinterpretation of landscape through limiting history text books. We all took turns reading the detailed events of each day leading up to the attack and got to learn what the offense was like from the perspective of lower ranked military personnel and what they were and weren’t aware of. 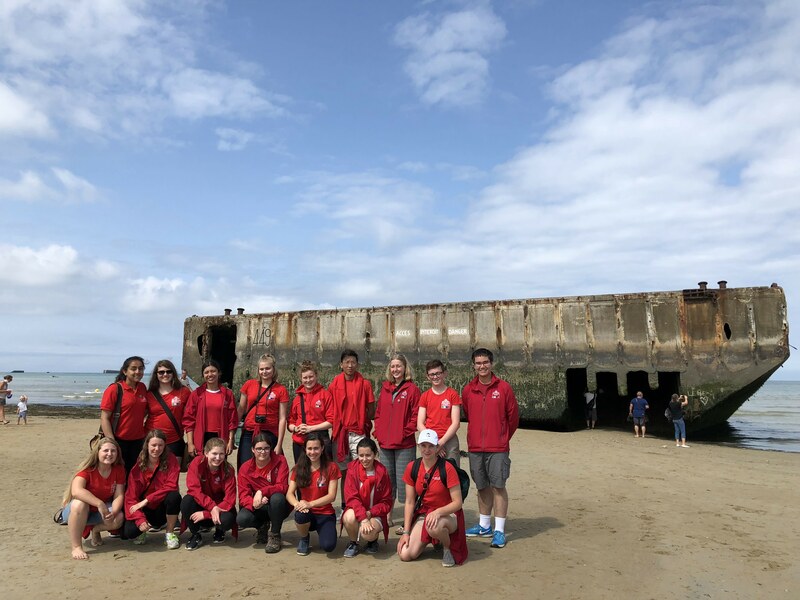 The remarkable thing about the Beaverbrook Vimy program is that our place of learning often does more teaching than the tour guides themselves, and our classrooms range from lecture halls and Oxford, to the battle fields of Belgium, to the sandy Juno Beach. Today, our 2018 BVP recipients visited the Juno Beach Centre where they received an excellent tour of Juno Park from Vincent. Later, they visited Arromanches, the Mulberry Harbour, and the Canadian Garden at the Caen Memorial. To finish the day, the group spent the evening at the Queen’s Own Rifles of Canada (Canada House). (Please note: students will blog in their language of preference). Today, our BVP 2018 recipients participated in a series of commemorative ceremonies for the 76th anniversary of the Dieppe Raid. The first ceremony took place at Dieppe Canadian War Cemetery where Rachel and Gordon laid a wreath and Alejandra and John read the Commitment to Remember. The second ceremony took place at Square du Canada where Stanford and Hannah laid a wreath. 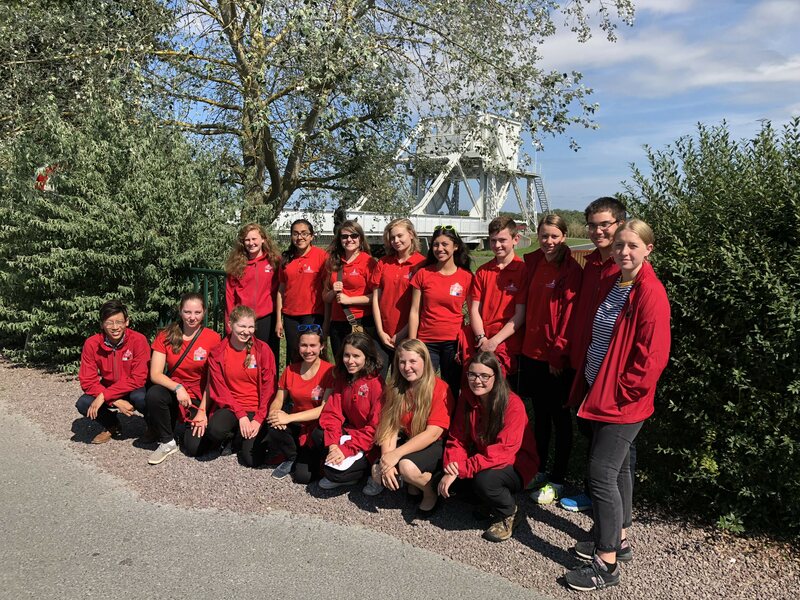 In the afternoon, the students travelled to Normandy, visited Pegasus Bridge, and participated in a private ceremony at Abbaye d’Ardenne, the site where 20 Canadian soldiers were executed by members of the 12th SS Panzer Division in June 1944. Read the students’ posts by following the link in our bio. (Please note: students will blog in their language of preference). 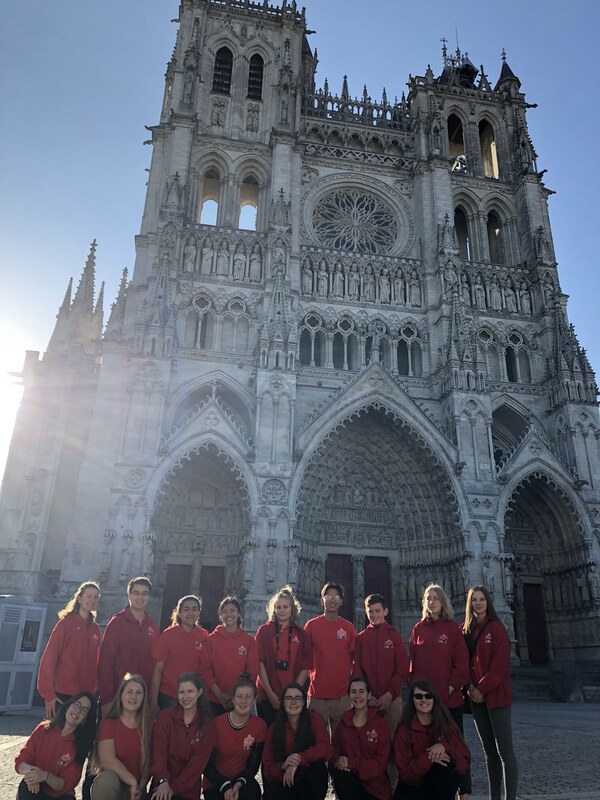 Today, our BVP 2018 recipients visited the Amiens Cathedral in the morning. In the afternoon, the students travelled to Dieppe and met with member of the French Resistance, Jean Caillet. Later, the group did a memorial walk through Dieppe, walked along Red Beach and White Beach and saw Blue Beach and Green Beach. In the evening, the students attended a Vigil for the 76th anniversary of the Dieppe Raids and took part in the honour guard at the Dieppe Canadian War Cemetery. (Please note: students will blog in their language of preference). Today, our BVP 2018 recipients visited the new Hill 70 Memorial. Later they toured the Mons Memorial Museum and visited St Symphorien Cemetery. In the afternoon, the group saw Cambrai and visited Bourlon Wood. To finish the day, Anna honoured her soldier at Vilers-Bretonneux cemetery on the centenary of his death. (Please note: students will blog in their language of preference).